Elegant oxford in soft, dressy leather. Innovative rubber unit bottom, cored out and filled with our proprietary Grand OS cushioning foam for comfort, lightness, and flexibility. The shoes are great so far! I'm really enjoying them and they are very comfortable! thank you! Beautiful shoes look and feel great. Straightforward, good looking, very, very comfortable and fairly light. Needed brown dress shoe for wardrobe. Very nice looking shoe. Amazingly comfortable - especially when you need to be on your feet all day! look great and feel great too. Looks like a beautiful shoe and great sale price! Love my current Zerogrands but these are a little dressier. Cole Haan known for quality. Sale price with > 25% discount. Didn't have any tan dress shoes. Always start with Plain Toe when starting new color in inventory. 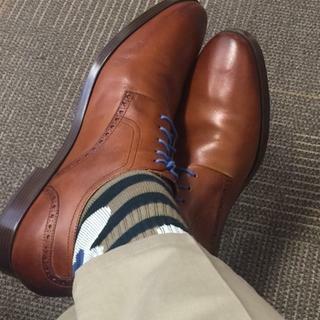 THIS MATCHES MY SUIT, ALL SHOES THAT YOU MAKE ARE VERY COMFORTABLE AND DOESN'T HURT MY FEET. needed to replace another pair of shoes for my husband that I had resoled once, but the cobbler warned me that it probably wouldn't hold up and these types of shoes aren't to be resoled. My husband loves the comfort and the sale was so good, it was time. We picked these because they have an athletic sole, but very professional. Looks beautiful, looks comfortable. Great deal! I love the plain toe style. It's a classic look that fits both work and even a dressed down summer wedding. I currently own a pair of Cole Hahn black wingtips and they are hands down the most comfortable pair of shoes I've ever owned. Love my black pair. Like this color. wanted the grand zero in brown but was in his size not available - good compromise. How well does this shoe perform on wet or sleek surfaces? I live somewhere rainy and want to be sure I buy shoes with good traction. BEST ANSWER: All three Jefferson styles have the same proprietary synthetic sole which is impervious to moisture. This sole has a unique tread design (see thumbnail pictures on product page) which provides grip, comfort and lightweight flexibility. BEST ANSWER: It’s possible, but a different sole will not have the cushioning and flexibility characteristics that makes the shoe so comfortable.